This yummy pizza can be quick and easy or a little more labor intensive, depending on #1. if you have sauce on hand and #2. how you want to veg it up. Being from an Italian-esque family, I always keep a little extra homemade marinara in the house, either in the refrigerator (if it was leftover from a day or so ago) or frozen in small portions for quick and easy meal whip-ups. This pizza starts off with some store bought naan. Whole Foods sells excellent 4 packs of both regular and whole wheat varieties. If making one or two pizzas, use the toaster oven, but if preparing for the entire family, preheat the oven to 375. One thing I hate is soggy pizza, so the first thing I do is slightly toast the naan before adding the toppings, this way the bottom gets nice and crisp! While the crust is crisping chop up some fresh veggies. Use your favorites or whatever is in the fridge, like me. 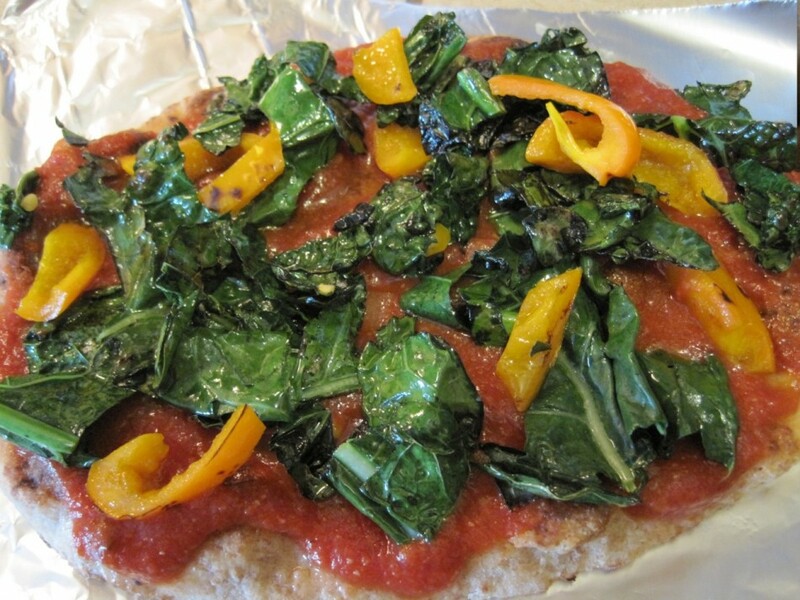 For this pizza I used: kale, yellow pepper and portobello. To soften the veggies, perk up the flavor and remove a little water weight, I quickly sauteed the kale and peppers over the stove with a little olive oil. Although the mushrooms contain a lot of water, I left them as-is so that they did not completely shrivel away while in the oven. Preparing the pizza is simple… spread the sauce out to the corners, pile on the veggies and then top it off with thin slices of fresh mozzarella. 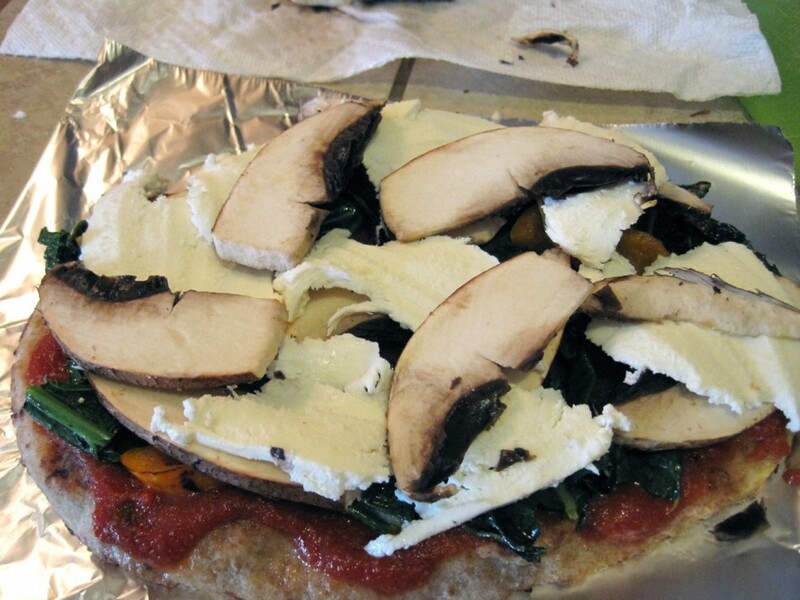 Place the pizza on top of a baking tray, or aluminum foil and cook until the cheese is melted and lightly browned – about 5-8 minutes. Enjoy!! 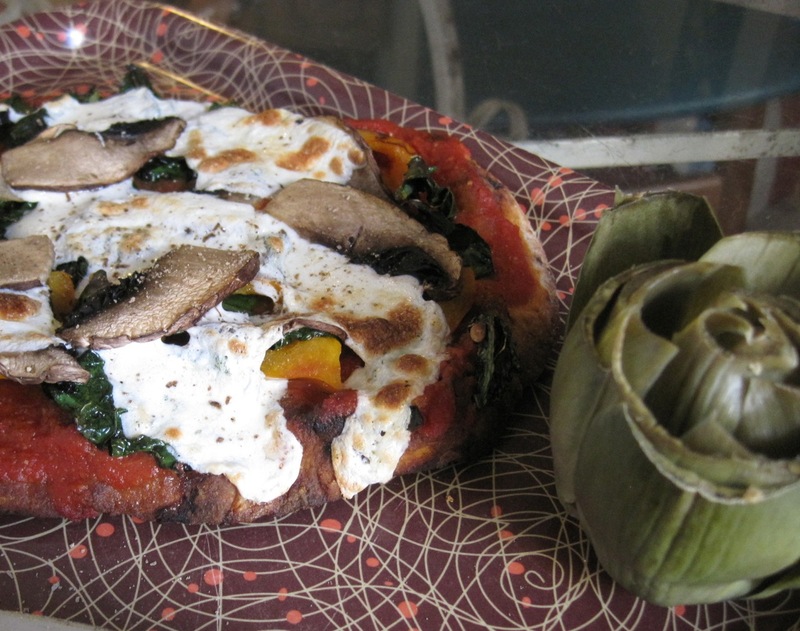 February 21, 2011 | Filed under dinner, lunch, snack, vegetarian and tagged with dinner, kale, lunch, naan, pepper, pizza, portabello, snack, veggies.